If you are looking for an easy way to share and view you and your friends Facebook and Flickr photos via iPad. A new app called Flickpad is definitely worth a download. Available in both a lite and paid version the Flickpad iPad App pulls photos in from your Flickr and Facebook contacts and displays them as if scattered on a table on your iPad screen. 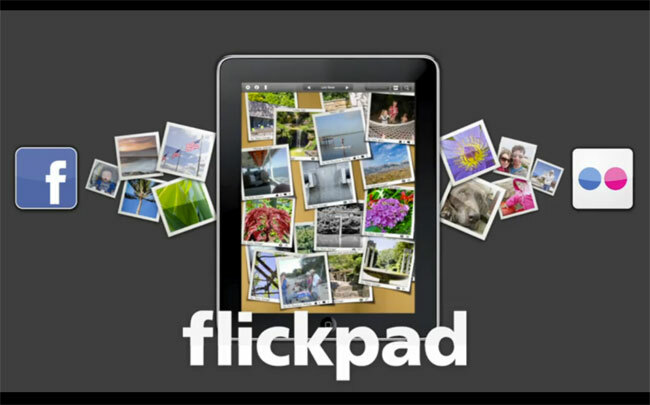 The Flickpad iPad App is not designed to be a Flickr image replacement browser but simply allow you to keep up and vie your friends photos that have been added or tagged that day. The mechanics of viewing are easy and intuitive allowing you to simple slide photos off the side of the iPad screen once seen. On photos are cached onto your iPad and need to be reloaded each time you enter the app, but hopefully an offline feature will be added shortly.